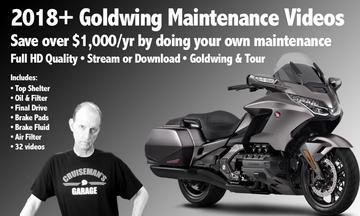 Cruiseman shows you how he performs regular maintenance on his 2018 Honda Goldwing. His techniques should apply to any 2018-2019 Goldwing or Goldwing Tour*. If you choose to perform your own maintenance, you could save more than $1,000 a year in dealer labor charges. Click on the link below to purchase and download this video.